Jose Mourinho has spoken for the first time since being sacked as Manchester United manager, telling Sky Sports News he still has a "future" in football. 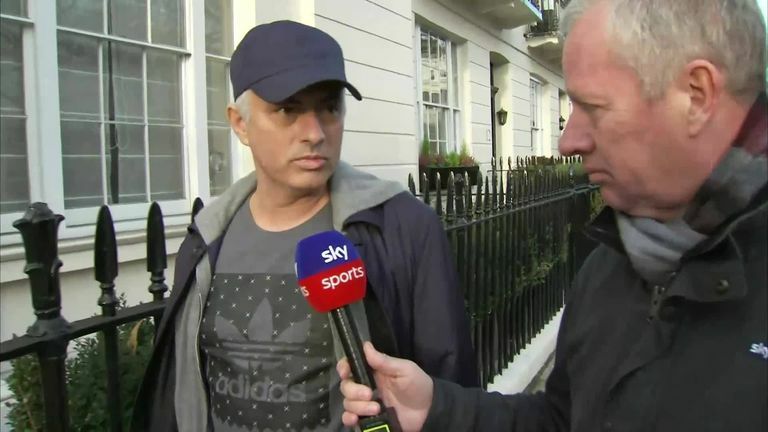 Speaking on the streets of central London just a day after he left the Lowry hotel in Manchester following his dismissal, Mourinho simply said it is "game over" at Old Trafford. Ole Gunnar Solskjaer replaced Mourinho in a caretaker role until the end of the season. "We could speak about so many good things, [some] not as good, but that's not me," said Mourinho. "It's finished. Manchester United have a future without me and I have a future without United." Mourinho was told of his fate at around 9am on Tuesday in a face-to-face meeting with executive vice-chairman Ed Woodward at United's Carrington training base, Sky Sports News understands. We could speak about so many good things, [some] not as good, but that's not me. He had only signed a new two-year contract until 2020 earlier this year but his troubled season began when he publicly criticised the United board for not backing him in the summer transfer market. Fractures in his relationship with Paul Pogba began to emerge in September and the France World Cup winner was stripped of the vice-captaincy before Sky Sports News filmed them having an animated disagreement on the training ground. The 55-year-old said he "has not changed" since he was sacked by Chelsea in 2015 and would not "speak about anything that happened in the club". Get Sky Sports Premier League and Sky Sports Football for just £18 a month. He said: "Why should I be sharing more now, even with the supporters, any of my feelings? "That's the way I've always been. I've been critical of managers that speak about details about what's happened and who is to blame. That's not me." Man Utd squad: Keep or sell? Mourinho called for respect from journalists earlier in the season, defending his managerial record and reminding them he had won more titles than the rest of his Premier League contemporaries combined. He has asked for privacy while he is out of the game. "Until I get back to football I think I have my right to live my life like I do now," he said. "That's what I want to do. Mourinho later released a full statement through his agency saying he has been "immensely proud to wear the badge of Manchester United since the first day I arrived, and I believe all United supporters recognise this". I have been immensely proud to wear the badge of Manchester United since the first day I arrived, and I believe all United supporters recognise this. Just as was the case with my previous clubs, I have worked with some wonderful people and I believe that some will be my friends for life. I know that you are all aware of my professional principles. Each time a chapter is closed I show my deepest respect and I don’t make any comments about my former colleagues. I hope the media will also respect my position and let me live my normal life until the moment I decide to return to football. Merry Christmas.